I’ve sorted out what I want to do with the inserts so I thought I would quickly share them. I think I should finish it at my crop tomorrow, providing my back holds out. 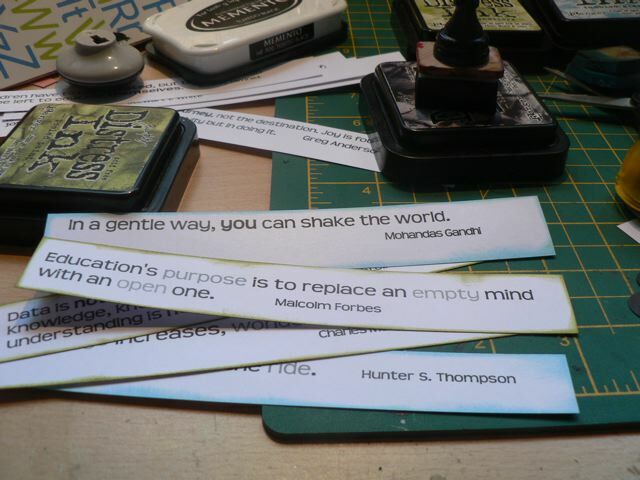 I am printing a series of quotes on paper. I am choosing plain paper, with just and inked edge because I am looking for maximum readability and my handwriting is pretty rubbish. 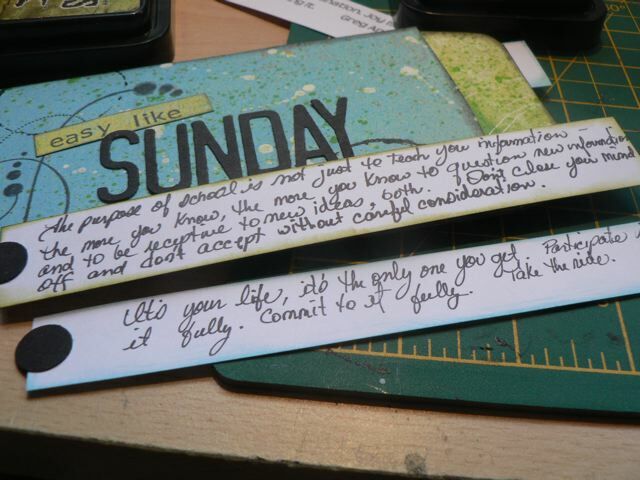 On the flip side of each I am writing my own thoughts on the quote. The ends of each slip will get a black circle and a smaller circle on the front, plain black circle on the back – the reason for this is so DS can take out a slip, read it, and then slip it back in, reversed. This will be an indicator to himself that he has already read it. Clever, hummm? 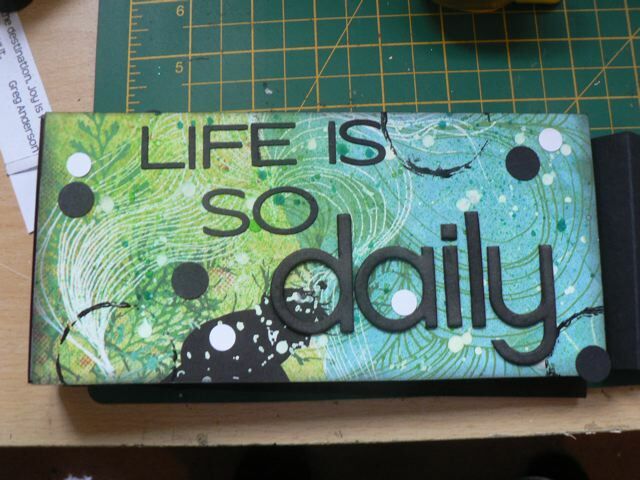 Anyway, I titled the book Life is so Daily (which is a quote from Inez Turley) and the cover will look something like this – not quite done, but close. I avoided loads of dimensional elements as it’s for DS so kept it quite grungy and graffiti in style, which will appeal to him more than lots of pretty touches – I’ll save that for DD. The back of each envelope will have a family photo, ones that I think will make him smile. I am loving it and enjoying the process – I just hope he does as well. Anxious to finifh it up now to make sure the final construction works. I’ll update on that next week. Off to crop tomorrow. 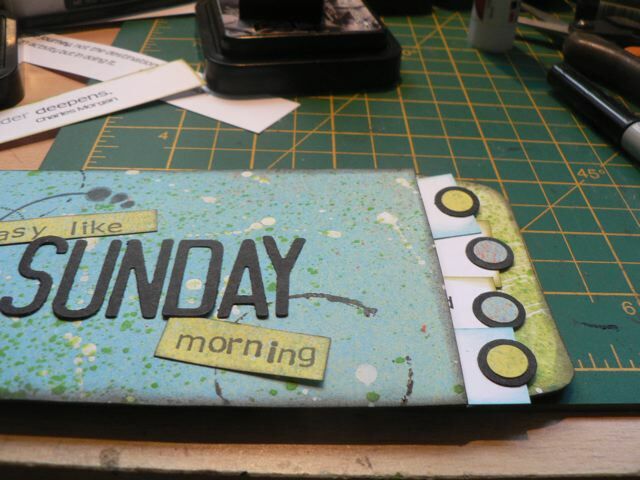 Hope you are doing something crafty with your weekend! 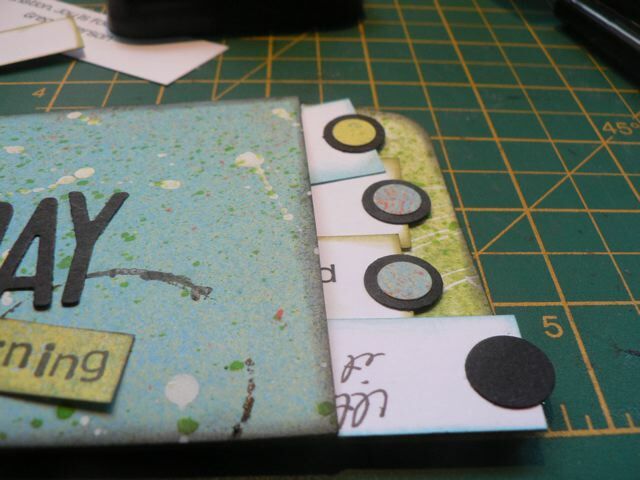 Categories: mini-albums, musings, scrap related | Tags: Photoshop mini-albums, scrapbooking | Permalink.